Please be reminded that we are not to park in our neighbors lot during the drop off and pick up process. They have informed us that they will be eliciting the support of PG county police department to enforce their parking policies. Thank you in advance for all role modeling best practices for our scholars. This week is a four-day week for students. Schools are closed Monday, February 20, 2017 in recognition of President's Day. When students return, the 3rd Quarter progress report window will be open. Students may wish to set aside time this weekend to check SchoolMax and complete missing assignments. Enjoy this long weekend! We will see you Tuesday. The Black History performance was amazing. Thank you to all the scholars who worked hard! On Saturday February 4, 2017, seven CMIT Elementary students competed in the annual Washington DC Area Kuk Sool Intramural Tournament which took place at CMIT Elementary in Laurel Maryland. 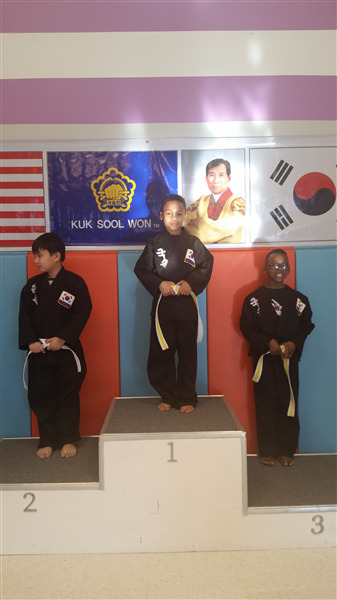 The tournament attracted nearly 100 students from the three Kuk Sool Won Schools in the DC Area. Ariana Noel took Second place in Staff Weapon, and was a finalist for Sparring, Forms, and Self Defense. Dami Fawehinmi placed second in Self-Defense, and was a finalist in Sparring and Forms. Dami won top honors for Female Red Belt. Aaron Stills won first in Forms and Self Defense, and was a finalist in Sparring. Aaron won top honors for Male Blue Belt. Amaris Tappin won third in Self-Defense, and was a finalist in Sparring and Forms. Shaun Howard won first in Forms, Self-Defense, and Sparring. Shaun won top honors for Male White Belt. Christian Sherrod placed third in Self-Defense, forms, and Sparring. Jordan McArthur placed first in Forms and Sparring, and second in Self-Defense. 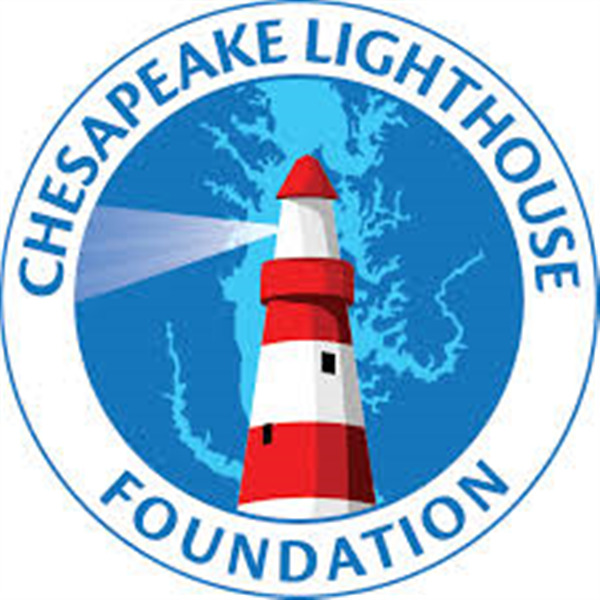 On Thursday, February 16th, a CLF Board meeting was held. Parent concerns and success stories were shared that were brought to the attention of the board prior to the meeting. Students should bring in their $10 club fee as soon as possible. It is time to get all of our supplies. Students should bring in a personal snack on club days. We have our first amusement park ride completed. We Participated in the Makerfest! We had an amazing time. We will continue working on our bridges this week! Our mobile rewards store is now open. This rewards system offers students a chance to cash in roar bucks earned for good behavior. A special shout out to third grade who cashed in the most roar bucks. Parents please send in donations of small toys for this cart. We need stickers, bouncy balls, pencils, pencil grips, etc. Thank you for you support. All items purchased for the cart thus far were earned from scholastic points from the last bookfair. Your children were very excited to shop. The roar cart will be opened at least one Friday out of each month! *** MAP Winter test parent reports and 3rd grade TAG Fall assessment report were sent out on Friday, February 17th with students. Please check your child's backpack for the reports. Thank you to the parents who sent sweet treats and trinkets of love to teachers today. We truly appreciate it! We will read the story "My Lucky Day." It is a story about a pig who meets a fox, and finds a way to escape him, making it his lucky day! We will be comparing and contrasting and identifying initial and final /l/ sound. Students will be learning about the water cycle! We will explore the different parts of the cycle and how it effects our environment! First grade will be working on chapter 14 this week. Chapter 14 is working 2D shapes. 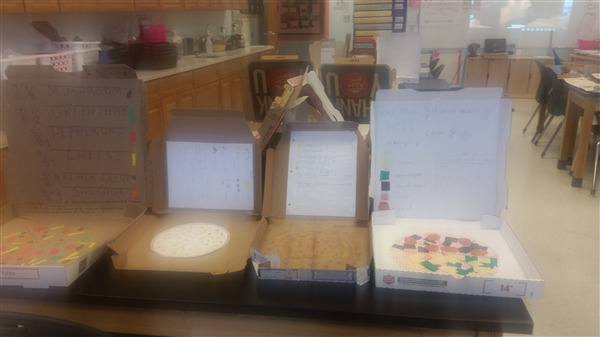 Students must be able to define each shape. We have come to the halfway mark of the third quarter. Progress reports will be issued March 7, 2017. Time surely does fly. We have enjoyed the Black History Celebrations on Fridays. The students have done a super job celebrating black history. We really appreciate all who volunteered to participate in the Black History Poster/Essay Contest. Thank you for hard work. In math students are continuing to understand fractions. This week the focus is to compare two fractions with the same numerator or the same denominator by reasoning about their size. Recognize that comparisons are valid only when the two fractions refer to the same whole. Record the results of comparisons with the symbols >,=,< and justify the conclusions by using a visual fraction model. Reading/Writing students will continue the novel study with the novel, Lowji Discovers America. Students will describe characters in a story (e.g., their traits, motivations, or feelings) and explain how their actions contribute to the sequence of events. 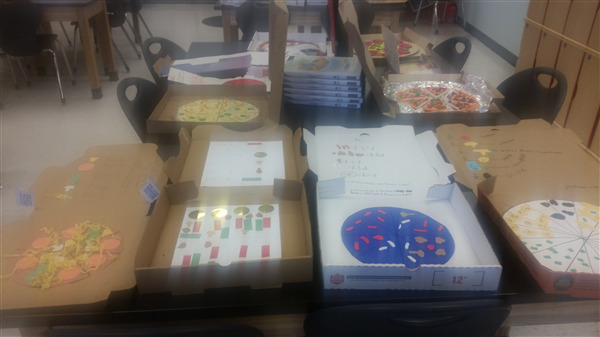 Well, we have begun the journey of learning about fractions. 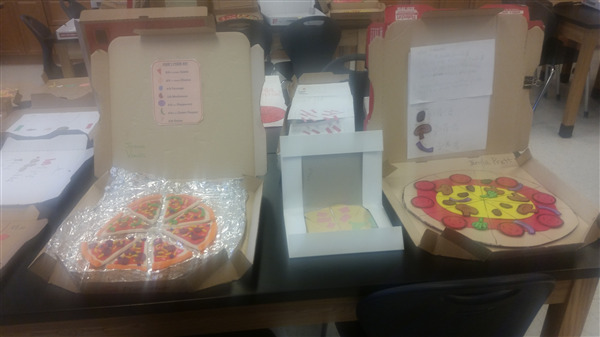 The students created fantastic pizza fraction projects. 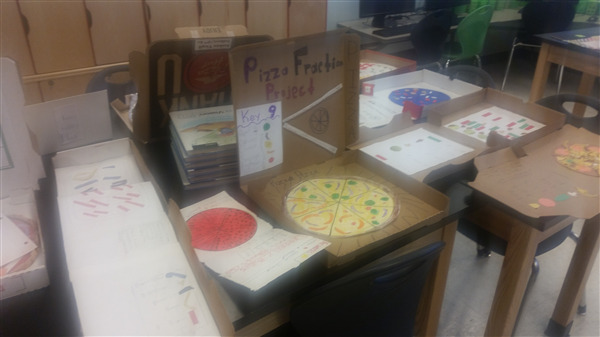 Here are a few of the wonderful projects the students created. Please review the website for updates. http://grade4.cmitelementary.org/. Our black history presentations were due February 17th. The absolute deadline will be February 24th. Students should also have a rap, skit, or poem to go with thei presentation. Students should be taking the online practice PARCC assessment for fourth grade math and reading. 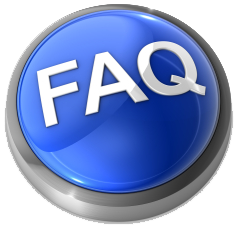 This will help them become familiar with the testing tools and questions. Students will need a shoebox for next weeks lesson in science. Students will create posters for Women's history month! Tenmarks is still due every Saturday. Students who have iready may substitute two Tenmarks assignments for Iready lessons. Please discuss the importance of following school rules with your child. Behavior challenges are on the rise. Thank you! A special shoutout to all the students who participated in the black history assembly. We enjoyed all the performances. Tolu, Musa, and William were our presidential trio! Naima S-B., (Cooper's Class) who is an avid reader and an exceptional student in Math & Science. She enjoys art and is very creative. Naima is on the Principal’s List. 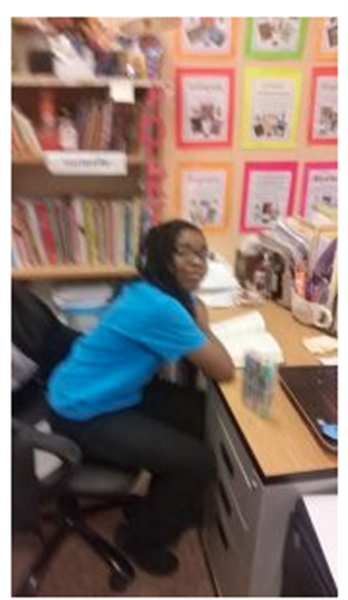 Mekayla M., (Watkis' Class) She enjoys reading and works well with all students and is very supportive. 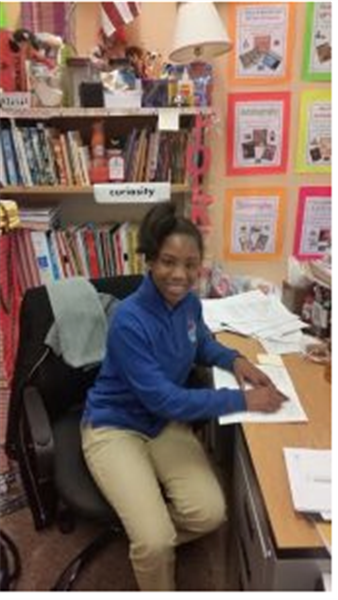 Mekayla is a rising star in Math and is an Honor Roll student. -Saturday Academy runs from 9:00a.m.-11:55a.m. (Reading and Math - Invites only.) However, it will not meet for Presidents' Day weekend. -Feb. 17th: MAP Testing Results (Math & Reading) were sent home with students. -Feb. 24th: Our third Black History assembly @ 8.30a.m. Grades 2, 5, and the CMIT Music Team will be presenting. If you have a student performing, you are welcome to attend-See you there! -Feb. 24th: Math-Topic 8 Assessment on Multiplying Fractions. -Feb 28th: Character Education PPT due- Students will present on this day. -Mar 1st: Reading (ELA) students' plays are due. 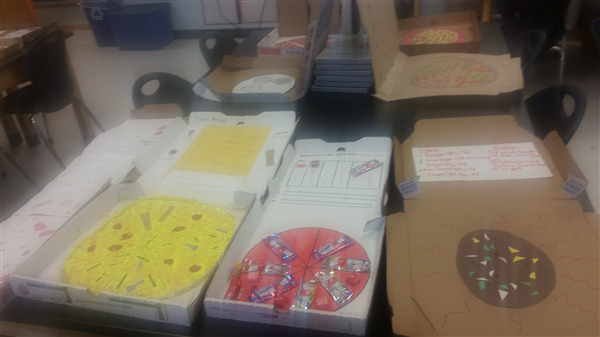 -In Science & Health, students are learning about "How Cells Work - DNA and Inherited Traits, including diseases (for Health). Some of our scholars will be exhibited at this art show. The dancers danced to Victory by Kim Burrell and Pharrell. They left the audience in awe, as they showed their diverse jazz moves. 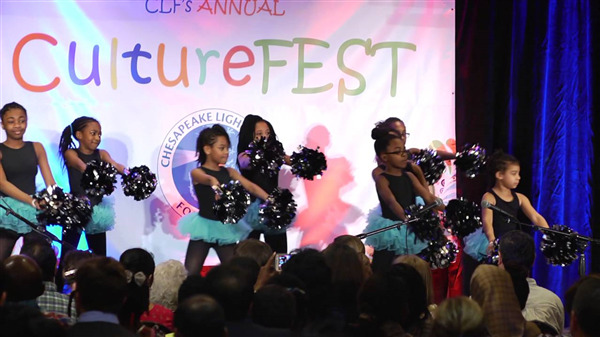 These young dancers showed charisma and showmanship. We look forward to our next performance in the Spring. Thank you parents for your constant support.